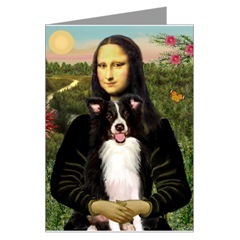 This section of the Border Collie Shop features Border Collie greeting cards, notecards, and postcards, For free online e-cards, scroll down please (they're listed near the bottom of this page). 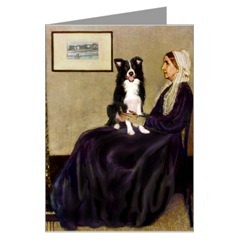 Card Section - Border Collie Greetings - Greeting Cards, Happy Birthday, Holiday Cards, Christmas cards, X-mas, xmas, Card, Postcards. Border Collies - THE DOG Artlist Collection. 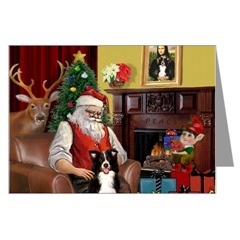 Our Border Collie Christmas Cards, can be found on our Border Collies and Christmas page ! Isn't it fun when you find the perfect card? The new "Artlist Collection" greeting card sets offer a rich variety of dog breeds and a dazzling array of card-styles, so finding that perfect card will be a breeze. The breed images range from whimsical to portrait-style, and everything in between. The cards are blank inside so they can be used for any occasion. They make a perfect gift! In every boxed set there are 2 cards of 6 different styles of a certain breed. That's a grand total of 12 cards and 12 envelopes. Each card measures 3.8"W x 5.3"H.
Bordercollie, bordercollies. Border Colie misspellings are: Boder Collie, Bordre Collies, Borde Collie, and Border Colly, Boder Colie (Boder Colies). Border Collies! 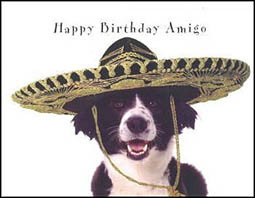 A Border Collie sits looking less than pleased while caption on front of card reads, "The songs. The snow. The angst." Inside of card continues, "The holidays are here. Hope yours are happy." 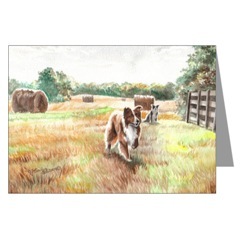 An envelope is included with this single 4.5" x 6.25" greeting card. Printed with vegetable based ink. Each set contains six identical 4 .5" x 5 .5" blank Border Collie cards by renowned canine artist Ruth Maystead. Includes envelopes. 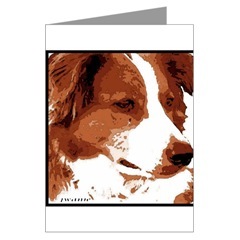 Border Collie Greetings, Greeting Cards. Notecards, Note Cards, and Stationery (stationary). 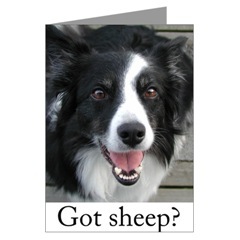 Border Collies Happy Birthday Card, Cards. 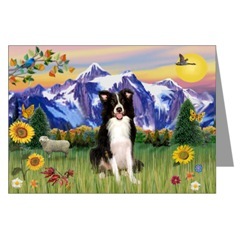 This unique card features beautiful images of the Border Collie with descriptions of the breed. Tri-Fold Card is blank for your message. Inside: "Our dearest friends live on forever in our hearts." Includes envelope. These brilliantly high-contrast note cards are a great Earth-friendly way to let your dog-loving friends know you're thinking of them. Original art printed with bio-degradable ink on premium 80% recycled (PCW), 20% managed forest fibers, chlorine-free paper. Box contains six blank 3.5" x 5" note cards and envelopes; three different background colors per set (one shown). Caption below image reads, "Season's Greetings," while the inside is left blank for your own personal holiday message. From the Hooray For The Underdog series of notecards from husband and wife photography team HealeyGrisham, a portion of every Underdog card sale helps to give grassroots animal welfare efforts a leg up. Package includes 6 cards and 6 dark red envelopes; 5" x 7". Inside: "Have a ball this Christmas!" Box of 16 cards, includes envelopes. Elegantly embossed cards measure 5.375" x 8.25". Working, Herding Border Collie. Enjoy a dog's eye view of this Border Collie watching the gathered flock. Buy your set of 6 catds today. Working Border Collie. 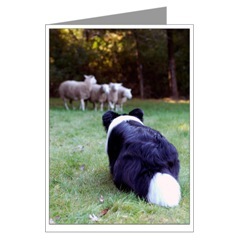 Enjoy a dog's eye view of this Border Collie watching the gathered flock. Buy your set of 6 catds today. 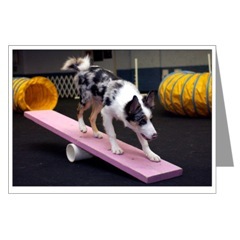 The Border Collie's intensity, energy and trainability make it an excellent agility competitor. You can feel the intensity in the Border Collie as he comes off the pause table. These images are available printed on other products, too! For example on art prints, mugs, ceramic tiles, apparel/shirts, calendars, stickers, and ornaments. 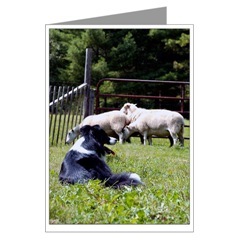 Card Section - Border Collies, Greetings - Greeting Cards, Happy Birthday, Holiday Cards, Christmas cards, Border Collie Herding Sheep Cards. Boder Collie. BC puppy in training. 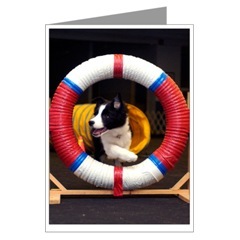 This Border Collie youngster is learning how to jump through a tire jump, on a puppy-sized agility course. BC Puppy in training. This Border Collie youngster is learning on a baby-sized seesaw. Image originally published in DogWorld Magazine. Ready, set... This Border Collie is anticipating the countdown so it can leap off the pause table and finish the agility course. Bring home a set of cards and enjoy the anticipation! 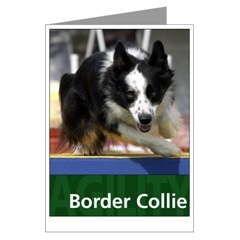 Cards Section - Border Collies. Border Collie Puppies, Puppy dogs, Puppy. Border Collies : puppie, pupy dog. BC cards: happy birthday, halloween, valentines day (valentine's day), friendship, thank you, congratulations. 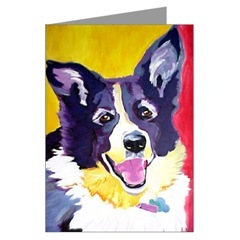 Wonderful, colorful Border Collie Pop Art cards, design by artist Alicia Vannoy. 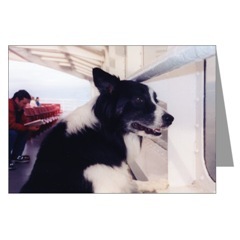 A Border Collie checks out the sights on the deck of a ferry from Victoria, BC to Port Angeles, WA. Send a fun greeting with this cute card. Border collies live to herd! Send a fun greeting with this cute card. 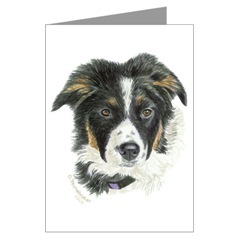 Cards Section - BorderCollies. BorderCollie Puppies, Puppy dogs, Puppie. Border Collies : hond (honde), hund (hunde), chien (chiens). 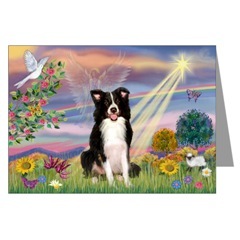 BC cards: Border Collie Pet sympathy Cards. 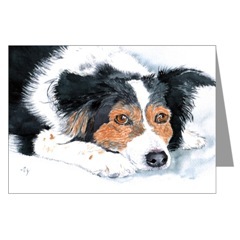 This design can be used to send as a Border Collie Pet Sympathy Card. A Border Collie in a beautiful, colorful landscape. 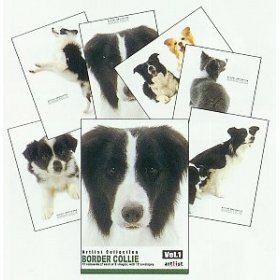 Cards Section - BorderCollies. BorderCollie Puppies, Puppy dogs, Puppie. Border Collies : hond (honde), hund (hunde), chien (chiens). 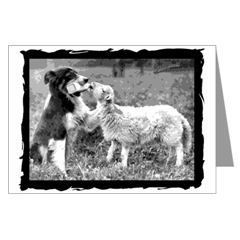 BC cards: Border Colley Pet sympathy Cards. For more BC Christmas Greetings, please visit our Christmas category! Two puppies survey an agility course. Watercolor. Cards Section - BorderCollies. BorderCollie Puppies, Puppy dogs, Puppie, Puppies. Border Colie, Boder Collie, Border Colley, Colly, Colleys, or Collys. "After Haying", a beautiful watercolor of two Border Collies in the field. 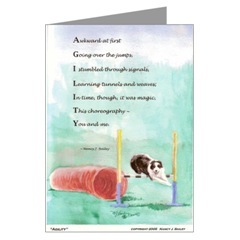 An agility poem graces a bright watercolor of a Border Collie dog running an agility course. The first letter in each line, when read vertically, spells "Agility". A great gift for any agility enthusiast! If you love Border Collies or know someone who does, here's the perfect gift. An original design based on a photo of a red border collie. Great gift idea for the dog lover. Design based on a vintage photo of a Border Collie feeding a lamb with a bottle. Great gift idea for the sheep herder or dog lover. 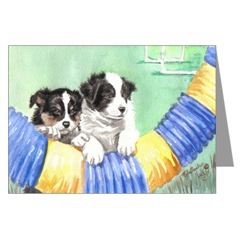 Cards Section - Border Collies. Border Collie Puppies, Puppy dogs, Pup, Puppies. Border Colie, Borde Collie, Broder Colley, Colly, Colleys, or Collys. --BOOKS --Books about Border Collie training, behavior, breed history. Children's books, too!